The findings were published online Feb. 4 in Nature Immunology. Cornelia Weyand, MD, Ph.D., professor and chief of immunology and rheumatology, is the senior author. The lead author is postdoctoral scholar Zhenke Wen, MD, Ph.D.
Rheumatoid arthritis is one of the most common autoimmune diseases, affecting about 1 percent of the population. It involves destruction of synovia, soft tissue that lubricates joints to prevent bones from scraping together. Whereas osteoarthritis is attributable to age-related wear and tear, rheumatoid arthritis results from a chronic attack on the synovia by cells of the body's immune system. The inflammatory character of rheumatoid arthritis also causes systemic problems. For example, it doubles the risk of heart disease. Existing rheumatoid-arthritis medications relieve symptoms but don't actually eradicate the disease by rectifying the behavior of the immune cells causing it, Weyand said. Why those cells go on the attack to begin with has been mysterious. But Weyand's team has clues. "We've learned that rheumatoid arthritis is, at root, a problem of faulty cell metabolism and, in particular, of one type of immune cell's inappropriate diversion of resources from generating energy to the production of an army of inflammatory offspring," she said. This cellular army exits the lymph nodes, makes its way to synovial tissues, takes up residence there and instigates the inflammatory damage that's the hallmark of rheumatoid arthritis. "We know how these immune cells fuel their bad behavior," Weyand said. "And now we've shown we can reverse this behavior and make these cells behave as they should." In prior work, Weyand's group noticed telling differences between the helper T cells of patients with rheumatoid arthritis and those of healthy people. The former, for instance, have low reserves of a molecule called ATP, which serves as cell's internal energy currency, accepted by all of a cell's myriad metabolic enterprises. Yet instead of directing their primary energy source, glucose, toward ATP production, these cells divert their glucose supplies toward fashioning various materials—proteins, nucleic acids, membranes and the like—used to build new T cells that will contribute to further damage. That shouldn't happen. Like all cells, T cells contain AMPK, a regulatory molecule that senses ratios of ATP and its two main breakdown products. If it finds ATP too outnumbered by these breakdown products, AMPK clamps down on the T cell's cell-building program and, instead, sends glucose off to the cell's ATP-generating apparatus. "When your house is cold, you need to throw your logs into your fireplace, not use them to build a new house in your backyard," Weyand said. Lysosomes have a reputation as cells' garbage disposals because they're full of cellular debris in the act of being recycled. But they're more than that. Their membrane surfaces are dotted with all manner of receptors, channels, enzymes and other proteins. Only when AMPK perches on the lysosomal surface and seats itself in a large protein supercomplex there does it get activated and poised to shut down an ATP-deficient helper T cell's biosynthetic materials-building apparatus and redirect glucose back to ATP production. Weyand's team obtained blood samples from 155 rheumatoid arthritis patients, an equivalent number of healthy subjects and a smaller number of patients with other autoimmune disorders. They extracted helper T cells from these samples and, analyzing them, found several striking differences. Rheumatoid arthritis patients' T cells had just as much AMPK as cells from healthy subjects or patients with other autoimmune diseases did. But their AMPK molecules weren't getting activated. Nor were they as likely to turn up on lysosomal surfaces. AMPK molecules in these cells were also much less likely to feature molecules of a substance called myristic acid affixed to their back ends. 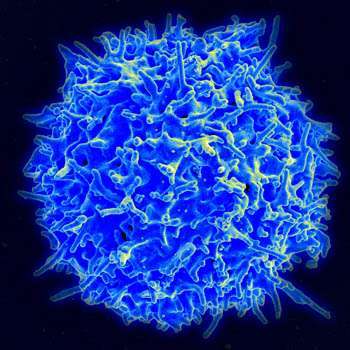 Rheumatoid-arthritis helper T cells also had much-reduced levels of the enzyme NMT1, whose job is to staple myristic acid "tails" to proteins' back ends. These tails, Weyand and her colleagues found, act as anchors pinning AMPK to the lysosomal surface. Laboratory techniques that increased NMT1 levels in rheumatoid-arthritis helper T cells caused the cells' secretions of inflammatory chemicals to drop. When injected into mice with human synovial tissue, unmodified helper T cells from rheumatoid arthritis patients caused severe damage to the human synovial tissue. But those with lab-enhanced levels of NMT1 produced far less inflammation or tissue damage. An exploratory compound, A769662, that causes AMPK to become activated even when it's just floating around in a cell's cytoplasm rather than anchored to a lysosome reversed rheumatoid-arthritis helper T cells' inflammatory output and their propensity to infiltrate and damage human synovial tissue in the mice, the study found.